After they paved paradise and put up a parking lot, paradise fought back. Peter Lippmann's photos foretell the fate of many a gas-guzzling machine with cars that have been reclaimed by nature. Lippmann's photo series is called, appropriately, Paradise Parking, and it's all the more beautiful for having antique cars as its subjects. 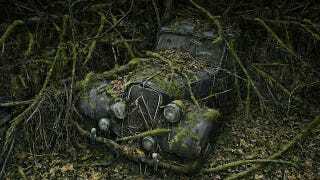 I imagine it would take a bit longer for some more modern vehicles to look so melancholy under the ivy. Lippmann will soon be publishing a book of these photos, also titled Paradise Parking.